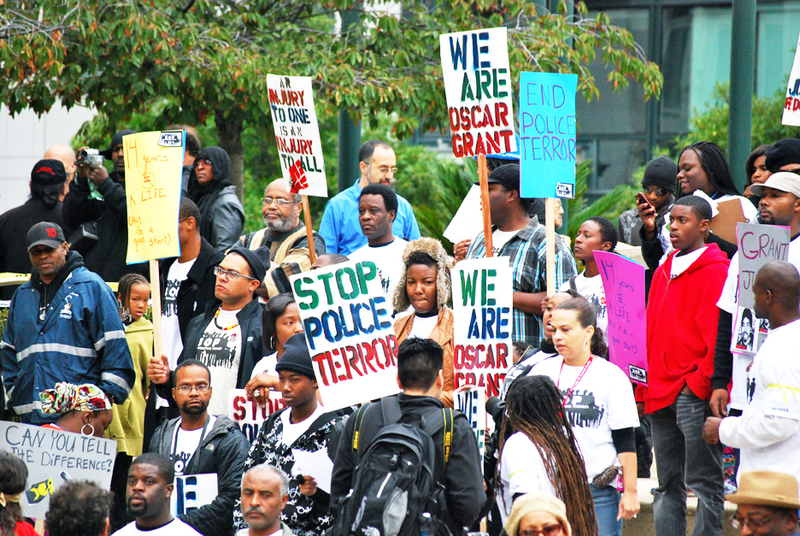 There is a something dangerous about the pervading view of justice for Oscar Grant. It’s one that constrains the perception of injustice to the bullet in the back, the soft verdict and the light sentence. On occasion it may challenge the legitimacy of the conditions under which such events occur, but it remains steadfastly committed to preserving the authority and power to control and coerce from which those conditions arise. It’s a view distinguished from conservatism only in that it does not grant the state an outright license to kill. It is the liberal view, the dominant paradigm of justice in our society, and we would do well to find an alternative. Until we do, we can expect the liberal view to continue to deter justice and to continue promoting the barbaric myth upon which it rests: that our ability to be free from harm is dependent upon the level of threat imposed by the state and its armed apparatus, constituted by our security and protection agencies. At the local level, in our communities, police and other law enforcement agents carry out this threat. So long as this threat remains, there can be no justice for Oscar Grant. According to the liberal view, on Nov. 5 Judge Robert Perry’s sentence has an opportunity to ameliorate a series of wrongs: a racially motivated bullet in the back and a lenient verdict for Johannes Mehserle. Some push further, insisting that given these past injustices, Perry is obligated to right prior wrongs by issuing the maximum sentence. This alleged duty obtains, of course, only within a given structure, a liberal framework, which grants Perry the power to institute justice. Insofar as this structure is maintained and Perry arrives at a sentence tolerable to those appealing to the state to “jail killer cops,” security is preserved and injustice is righted. In this case, that is, on the liberal view, justice is taken to be inextricably linked proportionally to the state’s punishment of Johannes Mehserle. Beginning presumably at a fixed minimum, but somewhere close to the maximum of 14 years, the greater Mehserle’s punishment – within normative judicial limits – the greater degree of justice is achieved. This kind of thinking has significant implications for the post-November liberal driven undercurrent of the justice for Oscar Grant movement. 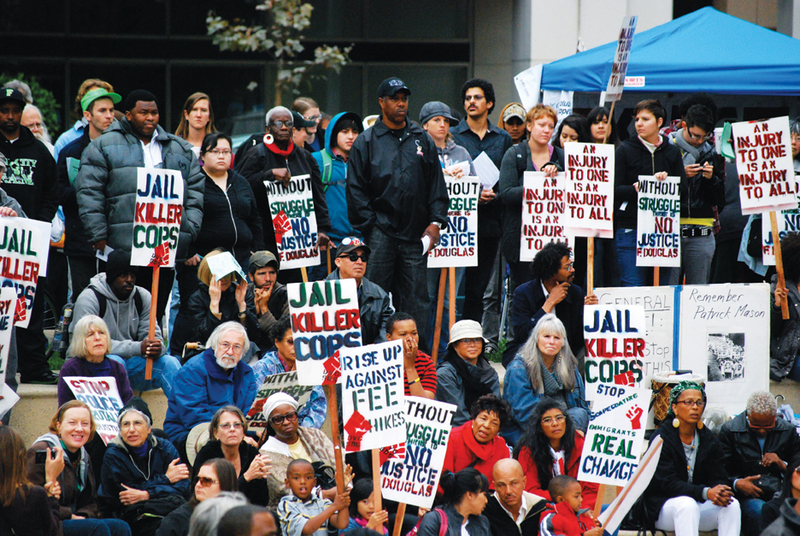 If the aim of this aspect ((The Justice for Oscar Grant Movement initially grew out of a spontaneous and rebellious uprising that initiated important radical developments (collectives, assemblies, organizing campaigns) in the Bay Area and around the country. These developments persist despite liberal usurpation.)) of the movement has been focused on retribution by way of the judicial system, i.e., state self-punishment, its perceived progress is subject to collapses at any instance in which the state decides not to continue abusing itself. Of course, to use the term abuse here is to give too much weight to state self-harm. The occasional infliction of punishment on itself is misleading. In offering up Mehserle as a sacrificial lamb, the state concedes nothing that would bear systematically on prospects for alternative views of justice. If the aim of this aspect of the movement has been focused on retribution by way of the judicial system, i.e., state self-punishment, its perceived progress is subject to collapses at any instance in which the state decides not to continue abusing itself. It may be the case that it is too soon to see the significance, if any, that such appeals to state self-punishment will have on curtailing police violence. But those communities affected most by police violence are not in a privileged position to wait for empirical results. And if the international publicity garnered by supporters of the Oscar Grant case is going to be looked to as a model for organizing against police brutality, its failure to prevent the brutal public police beating of Askia Sabur in West Philadelphia is a counter-example activists should take very seriously. In any event, this is a hypothetical question regarding effective strategy within the structure of liberal justice, not the proper understanding of justice. The barbaric myth remains; the traditional roles have just been replaced. Our ability to be free (from police) is dependent upon the level of threat (self-imposed) by security and protection agencies, overwhelmingly the state and its armed apparatus. In fact, by focusing our attention on Mehserle and putting cops on trial more generally, we are able to see more clearly the absurdity in adopting the liberal view of justice. That is, we see now, as did both Oscar Grant and Askia Sabur, that our ability to be free from harm is strictly dependent on the whim of the state, or whether they choose to engage in self-restraint. The liberal view may not choose to stand behind one cop, viz., Johannes Mehserle, but most share the admiration for law enforcement as “a thankless job that most of us don’t have the courage to do” and for officers “who daily put their lives on the line for” us – even though some may shun the admiration while upholding the mandatory privilege for police to do harm. As I mentioned at the beginning of this essay, this is a dangerous view. Clearly it presents no danger to the state. If it did, there would be ample evidence of counter-resistance. To illustrate this, we might compare, for example, the loosely organized rally on the day of the Mehserle verdict and the recent ILWU-initiated labor and community rally calling for “Justice for Oscar Grant! 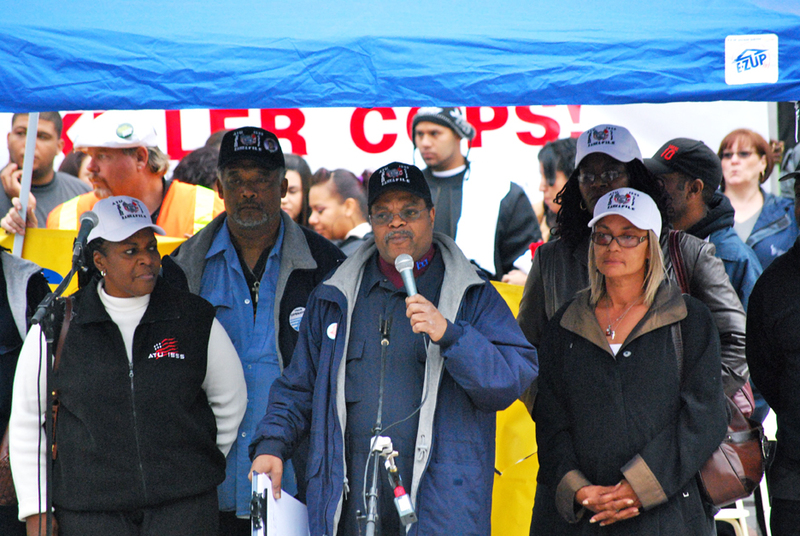 Jail for Killer Cops!” in preparation for the Nov. 5 sentencing. Now, by “get violent,” “Operation Verdict” was not preparing to step in should rally activists begin harming one another. By “get violent,” police meant they were training to defend themselves and also the ubiquitous capital interests in downtown Oakland. There is an ample documentary record of the events of that night that demonstrate the enormous police presence. Needless to say, the events on the ground were palpable. OPD’s “Operation Verdict,” “training for the possibility it could get violent,” was not preparing to step in should rally activists begin harming one another. By “get violent,” police meant they were training to defend themselves and also the ubiquitous capital interests in downtown Oakland. This was not the case at the ILWU rally. The Oakland Police Department was just noticeably present, with only several teams of cops peppering the corners of City Hall, where rally organizers had received a permit to be. On the liberal view, is it not ironic to request permission from the City of Oakland to hold an event that requires Oakland police and to hire additional private security – Urban Shield – all in order to protest police brutality. The liberal view is a dangerous view because it seduces us to sacrifice freedom for protection, while insisting that protection is not control and manipulation, but itself a type of freedom: freedom from harm. There is little difference in this respect between the liberal siren and the police siren. Both aim to steer us in a particular direction. It’s the presence of this siren that is inconsistent with justice for Oscar Grant. And if, in this respect, we are all Oscar Grant, we would do well to resist its call. The liberal view is a dangerous view because it seduces us to sacrifice freedom for protection, while insisting that protection is not control and manipulation, but itself a type of freedom: freedom from harm. The task ahead is markedly different if we adopt a view of justice for Oscar Grant alternative to the liberal view. An emancipatory view, for example, pinpoints injustice for Oscar Grant not from the moment he was pulled from the train or shot in the back, but from the moment Mehserle put on his badge. It was at that moment that Mehserle asserted his authority over Oscar Grant. And it is this relationship that gave rise to the context in which Oscar Grant’s safety, indeed his life, was relegated to a series of events beyond his control. This fact, that Oscar Grant’s life was arbitrarily in the hands of someone else, is the injustice Oscar Grant suffered. And if we take seriously the recent creed that “we are all Oscar Grant,” we have much to do even after November. Nick Theodosis is a graduate student in social and political philosophy at San Francisco State University. He was a member of the ILWU-initiated Oscar Grant Rally Organizing Committee. His writing on Justice for Oscar Grant can be found the San Francisco Bay View National Black Newspaper and at Oakland Local, where this story first appeared. He can be reached at nmtheo@mail.sfsu.edu. Oscar Grant served two state prison terms for various felonies including a conviction for drug dealing. In 2007, San Leandro police stunned him with a Taser to subdue him after a traffic stop, in which he threw the pistol into the air and ran. He was sentenced to 16 months in state prison. Oscar Grant III – a real pillar of society! Unreadable. Every noun has an adjective, and the sentences drift on and on. "The liberal view is a dangerous view"
It is a story about the judge sentencing the officer in the Oscar Grant killing. "These bastards, (sorry PL but that is what they are), would not be satisfied unless he was given the death penalty! This Officer should never have been charged, much less tried and convicted. It was a tragic accident that never would have happened if the POST that was shot had simply submitted to arrest, or better yet, had not been involved in the illegal activity in the first place. This has already destroyed the life of a fine young man who put his a$$ on the line to help the very people that convicted him. FOR SHAME! I say declare Marshal Law and stop this immediately!" This is just one example of the hateful comments posted by members of policelink. It is tolerated. @ guest: My thoughts exactly. It actually hurt to read this article. And written by a grad student? !